First time in 20 years – more daily record lows than daily highs that were either tied or set in 2013 | Watts Up With That? 2013 was a cool year in many ways. Most interestingly, the last year this split between highs and lows happened in the USA, in 1993, we had the eruption from Mt. 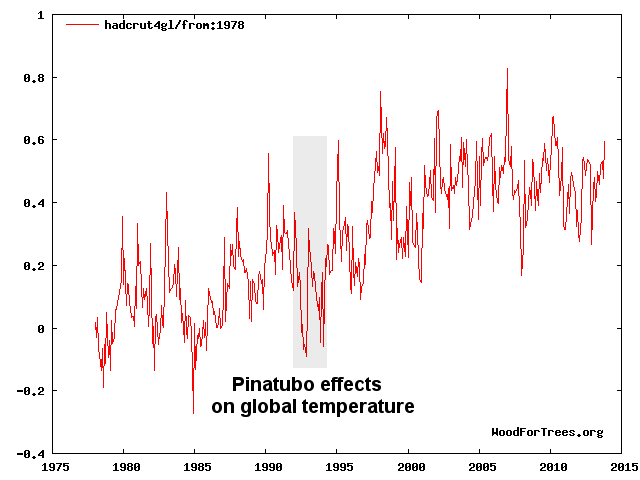 Pinatubo the prior year which ejected so much aerosol into the atmosphere that it blocked sunlight and cooled the planet. This table from NCDC pretty well sums up the headline. Note also the “Last Year to Date” line on the bottom. in 2013, we have less than one-third of the number of record highs as in 2012.
h/t to Doyle Rice at USAToday. if anyone has any similar weather record comparisons for the rest of the world, don’t hesitate to list them in comments. But last year it was climate; this year, it’s just weather. Besides, it’s well known that global warming makes things colder, ever since it became climate change. And 97% of all scientists who get money from the government to say the climate is changing say that the climate is getting hotter. True, but we have had plenty of smaller eruptions this year, some making stratosphere level and others pretty close. 2011 & 2012 were pretty quiet, 2008-2010 had a lot of honkers. Do believe we’ll get a fair bit of rain east of the Rockies from San Miguel in El Salvador. I was under this when it came over. A little fine stuff was coming down, could see it running the beagle at night with a headlight. Fine ash on my truck hood the next morning. Probably because this is more what the actual temperature records look like ignoring those adjustments applied to the records, lower in the past, positive in the present, and it is literally getting colder now. Common people understand this when you ask. The linear adjustments remove are from a rough estimate from these published charts USHCN, GISS, and NOAA. I see this as another sign that Dr. Habibullo Abdussamatov might be right. Our present “hiatus” might be a maximum, not a pause. I’m sure he half-hopes to be wrong, living in the Ukraine. Sadly there are a few major volcanoes ready to blow, such as Katla in Iceland, the alarmists may hang on a few years yet, by playing the aerosol card. Don’t forget that records are uncorrected for station problems. All stations send in high and low records whether somewhat quality controlled (e.g. USHCN) or supposedly adhering to minimal standards (e.g. COOP stations). Although not very common, there can be new low max records due to new irrigation or dams. But by far the biggest source of errors in records is heat islands mostly causing new high min records and local heat sources from poor siting that might eliminate possible record lows while adding artificial record highs. The USHCN as many stations that can easily paint new high min records like newly urbanized Norfolk Virginia: http://shpud.com/weather/main.php?g2_itemId=48 . More bogus high min records are obtained from stations like the gravel endowed Reagan National Airport in Virginia across the river from DC: http://shpud.com/weather/main.php?g2_itemId=155 and http://shpud.com/weather/main.php?g2_itemId=158 But the biggest problem is the artificial lack of low min records from such stations. Obviously the gravel doesn’t matter on breezy nights when a high min record might get set with humid south wind. But on radiational cooling nights without wind, heat is convected from gravel up to the thermometer. It’s interesting to note that all the numbers for records in 2012 are higher in the image for the Wayback Machine. Must be that quality control eric1skeptic mentions. But even then, the difference is at most 54, nothing like hundreds. So unless “quality control” jiggers the figures, it’s unlikely to overturn Anthony’s observation. More record lows than record highs … well, that’s one little factoid that you’ll never hear on the network nightly noise. In all fairness, a single year doesn’t prove anything. However, this could be the start of a trend for more cold records than more warm records. If the theory on the solar minimum and cooling pans out, the next 10 years should prove to be very interesting. Sort of rubs it in that cycle dominate in nature, the belief in linear trends to catastrophe might be delusion. Its freezing pretty good here in Northern Canada -50 C, I want some global warming. Sorry, but the warming continues unabated. The money tree says so. It is interesting that 2013 was the first time in 20 years that record US lows exceed record US highs. One might attribute that fact to weather if there were not the curious increase in sea ice both poles (and if there were not a half dozen anomalies and paradoxes that disprove CAGW). Odd that Hansen’s dice do not work in the Antarctic and cannot explain the largest increase in sea ice on record in the Arctic. It appears there will be many interesting ‘climate change’ topics to discuss in the 2014. Happy new year Anthony. Happy new to your very patient Moderators. Happy new year to the many Contributors to this blog. It is now fairly obvious that the scheme all along was to take humanity down the wrong path to survival and the right path to population decimation. Warmth produces food, cold does not. Had we spent the last 30 years inventing ways to produce cold weather crops and store them, then millions had a chance. My friends in Thailand are sitting around with big jackets and beanies on. First time in their lives. It really is worse than “we thought”. 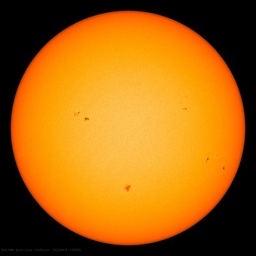 Thank God for solar cycle 24 grand solar minimum! And solar cycles 25 and 26 if historical precedent is to be trusted. Global warming predicts record cold temperatures. In fact, global warming predicts that the earth will freeze (unless it doesn’t). Ya, ya, but be careful what you ask for; you might get it. If worst comes to worst, it will make the projections of CAGW look like happy dreams. So one regional extreme (2012) is followed by another regional extreme (2013)? Hansen’s loaded climate dice come to mind indeed. Let’s see what happens next year. Let’s all just hope that we have a gentle slow down off the plateau, and not a cliff. 90 degrees plus as per usual in Thailand during the day. Not exactly big jackets and beanie weather! I suspect if you excluded all stations with less than 80 years of records, most of the “record highs” would disappear. 3) Only one was USHCN. Interesting trend over the last few years? if it hits -15f today we (Maine) will break our cold record for the day. was -11f at 530am. may hit 12 or so today. Village Idiot sorry but the ‘weather’s not climate’ argument is a dead duck , given the numbers of times any extreme weather event has been jumped on as ‘proof’ of AGW . I fact I will give you 100-1 the first extreme weather event of 2014, no matter what , will follow this pattern. Dangerous cold in Canada for the last month or more. Hope the polar vortex doesn’t move southward bringing it down here to the mid-Atlantic states like it did in 1994. Lo Max beat out High Min as well. Last year there were 3.5x as many High Min as Lo Max. There’s been a striking shift in SSTs in the last week or two, from cold SH and warm NH a fortnight ago to warm SH and cold NH now, especially in the Pacific. Interesting reversal. My tentative prediction of a La Nina Pacific cooling in early 2014 still seems to be on the cards – barely. The heat wave in Argentina is part of this. SSTs are “only” surface, not OHC, but SST is where meteorology meets oceanography. Warmth produces food, cold does not. Had we spent the last 30 years inventing ways to produce cold weather crops and store them, then millions had a chance…. Unfortunately you are correct as this article shows: Want Food Security? Bring Back a National Grain Reserve. I won’t say what I think of the occupants of Washington D.C. (I don’t want to be banned) but my opinion get lower with each passing year. “Cherry picked ice” (as mentioned by a commenter on one of the posts and made me rotfl) around the “Antarctic research ship” seem to bring the notion of cherry pick to a new level. It is no wonder that some get confused. Agreed, but a chaotic climate with two ‘Strange Attractors’ indicates a jump from one state to the other that can be very very nasty. That is why this refusal to give up on the CAGW scam is so dangerous. We need the time to prepare. Even if we do not go into glaciation it is still going to be cool not warm. Thousands of years of a lower level of solar insolation, 9% below the Holocene Optimum, means the oceans are going to gradually cool. That means lower temperatures no matter how much anyone claims the sun is constant and has no effect on climate, no matter how many claims are made for the CO2 magic gas. ….The onset of the LEAP occurred within less than two decades, demonstrating the existence of a sharp threshold, which must be near 416 Wm2, which is the 65oN July insolation for 118 kyr BP (ref. 9). This value is only slightly below today’s value of 428 Wm2. Insolation will remain at this level slightly above the glacial inception for the next 4,000 years before it then increases again…..
A less warm 2013 is no one-off fluke. It’s the result of multidecadal cycles that will confirm cooling going forward, further invalidate models and mantra, and help confirm those cycle effects of pdo, amo, and solar. Someone forgot to be patient and read this thread just out! The claim has been debunked by someone who became suspicious. Think replanting after earlier frost damage being the ’cause’ Village Idiot. Thanks for clipping Climate A’s wings, my mouse scroll is wearing out bypassing that characters posts. Last winter here in the NWT Canada weather went to -30C early and stayed there for weeks, this winter came in slow, mildly warmer than usual, but has gone to low 30s and early 40s for last few weeks. Seems to be following that approximately 60 year cycle from the temperature records. After -30 it is interesting the way the moisture clears out of the air, the only fog comes from human sources. Windless and sunless, the waste heat rises straight up from every chimney and exhaust pipe, gradually a manmade fog forms over this town. Crystal clear outside town. The biting cold, increasing cost of vital heating fuel and definite lack of any unusual weather should convince even our elected idiots, but they are well insulated from reality by floods of federal money. It is also interesting to look at the other two daily records: high minimum, and low maximum. Since the mechanism for CO2-based warming is increased heat trapping, one would mainly expect the warming to show up in record-high nighttime minimum temperatures, more than record-high maximums. Yet the record-low maximum temperature (perhaps associated with increased cloudiness? There’s no other obvious physical mechanism that should cause these) exceeds the record-high maximums as well. For Canada the winter temperature departures from 1961-1990 averages [as per Environment Canada data] have been basically flat since 1998 when measured on the National level. However regionally it is quite a different picture. 7 of 11 major temperature regions represented by about 53 % of Canadian land areas [, mostly western and north western Canada,] have had winter temperatures declining since 1998. For another 20 % of the land areas involving Northeastern forest areas ( Ontario and Quebec ] , the winter temperatures have been flat since 1998. Only the Atlantic region and Arctic Tundra, Mountains and Fiords, representing about 27 % of the land area show winter warming since 1998 mostly due to the past warm Atlantic Ocean. However the Canadian Arctic region has started to cool post 2010 and winter temperature departures have already been 4-5 degrees cooler in the Arctic, tundra mountains and fiords. The current winter looks like it is going to be extremely cold across most of Canada but especially in the west, northwest and the Great Lakes region where temperatures around -45 C are being recorded. January and February are predicted to have below normal temperatures . I see Canadian winters getting even colder over the next several decades and new winter records being set as both coastal areas and the Arctic also cool due to cooling ocean SST. All this is happening despite the IPCC predictions for warmer winters for North America.. Canadian spring weather has also been getting cooler and this is not good news for the American tornado season where cold Canadian spring weather has meant bigger and more frequent tornadoes [like 2013 and 1974] in United States. Unlike January’s freeze, when snow and sleet fell in the Orlando area , no precipitation is forecast for the rest of this week in Central Florida. 20-Degree Temps Coming To Central Fla. The coldest air of the season is pushing through Central Florida. ORLANDO, Fla. — The coldest air of the season will blast Central Florida by late Monday night and record-low temperatures in the high teens to mid-20s are expected across the region. Hard-freeze warnings — temperatures below 28 degrees for at least three hours — have been issued for Orlando and all of Central Florida. The record-low temperature of 28 degrees for Dec. 14 was set in 1962 in Orlando. Record lows in Daytona Beach and Melbourne for the same date are 26 degrees, both of which were also set in 1962. All three records could be broken early Tuesday morning. Ocala, which is located about 75 miles northwest of Orlando, is forecast to have a low of 19 degrees early Tuesday morning. You are correct about 2011 being perhaps more significant [ the highest number of US spring tornadoes] . However when i wrote the blog , the 2013 very cold spring season in the Canadian Prairies was still fresh in my mind together with the 247 tornadoes in May 2013 in United States including two very big tornadoes ,a F4 and a F5 . The spring of 2013 was the 14th coldest spring for the Canadian Prairies at -2.3 C below average . 2011 was also cold at -1.6 C below average [ 1961-1990 averages]. 1974 was -2.8 below average . Pft it’s just the mysterious heat pump transferring heat into the deep ocean. Explaining away inconvenient truths in ways that break the laws of physics is what climactivists excel at.